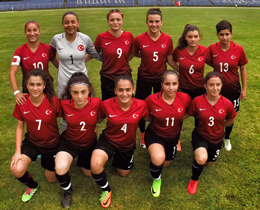 Women's U17 National Team, coached by Necla Güngör Kırağası, beat Bulgaria in two friendlies which were played in Bulgaria. The first friendly game was played in Rakovski Stadium, Sevliova, Bulgaria and Turkish Women's U17 National Team beat their rivals 3-0 by Benan Altıntaş (Min. 10 and 66) and Melike Öztürk's (Min. 13) goals on 29 August 2017. The second match was played in Dryanova, Bulgaria and Turkey won 1-0 by Şehriban Dülek's (Min. 6) goal.